Government House is one of the most interesting buildings to see in Melbourne (and is actually stated to be one of Australia's finest buildings). ........Completed in 1876 it is of a very attractive Italianate design on the outside and has some wonderful rooms inside. 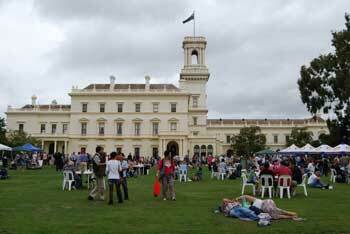 You can get a free tour every Australia Day between 10am and 3pm. Australia Day is always on 26th January. ........There's a musicians gallery at one end and the State Chair at the other end. This chair is only ever used by the Monarch or the Governor apparently...... (but I bet one or two of the staff have had a sneaky go)! This Ballroom was said to be the largest in the British Empire and a complaint about it was that unless you invited 1400 people it seemed empty. 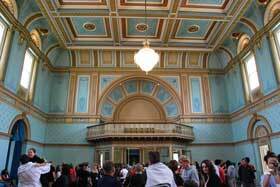 From the Ballroom you'll join a queue through a number of the other fascinating rooms including the apartments. Once you're finished here, don't miss the gardens where there'll be free childrens entertainment and music. 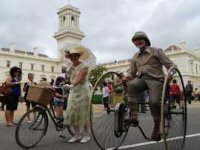 You'll also find costumed bicycle riders on old fashioned bikes like Penny Farthings which really helps to conjure up images of the old days here in Melbourne - if you had money, that is. Check out where it is on the map below. Get there early to avoid the queues. Obviously, if you do visit on 26th January you'll have passed about a million other free things to do around here every Australia Day including a parade down St Kilda Road, the RACV classic car display, loads of things for the kids to do like free face-painting and games, and live music including within the Sidney Myer Music Bowl. Have fun! !